Will you get an education or a cool tatoo? Maybe you'll event the Flaming Moe, drive the monorail or raise tomacco. Perhaps you'll join the Stoncutters, catch a three-eyed fish or appear in the next McBain film. Just beware of all-syrup super-Squishees, Quetzlzacatenango peppers and the exotic wiles of Princess Kashmir. Make your mark on Whacking Day and you might retuire to Mony Burns' Manor. Or forget all that and just play this great game. 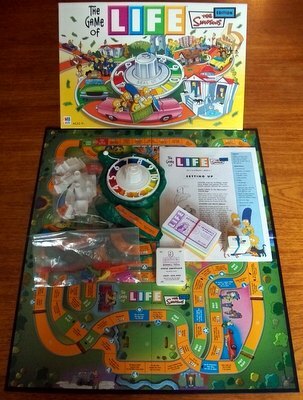 This game is complete and the contents are in mint condition. The money is crisp, the cards are clean and uncreased and the board is immaculate. The playing pieces and miniture structures are likewise in excellent condition.